Call us at (909)-628-0091 or (909)-394-4545 today! Hofacre Optometric Corporation takes pride in being your home for affordable family vision care. Your eyes are among your most valuable assets. Therefore, it is important to take good care of them by scheduling regular checkups with your trusted eye care specialist. If you live in the Chino Hills and San Dimas, CA areas, Hofacre Optometric Corporation is an excellent option for comprehensive, affordable optometry care for the entire family. We have provided outstanding optometry services to area patients since 2001. We also accept and give referrals as needed. Our office uses advanced technology and testing modalities to assure that you and your family have the best eye care possible, and at reasonable prices. Our optometry team uses state-of-the-art technology to evaluate the general health of the eyes, and our patients' needs for eyeglasses. We perform comprehensive vision exams to diagnose refractive errors and vision disorders. Our doctors offer solid optometry experience in all aspects of contact lens design and fitting, as well as expert eyeglasses prescriptions and fittings. Since we strive to become aware of the latest in eye care technology, we proudly offer the best choices available. Whether you need contacts or eyeglasses specifically for computer work, for sports, for medical conditions, or you just want to try something different, Hofacre Optometric is here to meet your needs at family-oriented prices. Additionally, we test for various eye conditions including glaucoma, cataracts, and diabetic and hypertensive eye diseases. We also treat eye infections, injuries, scratches and eye pain. We also offer post-operative care for cataracts and for LASIK surgery patients. It is our dedicated goal to give each patient the highest quality eye care that he or she has ever had. 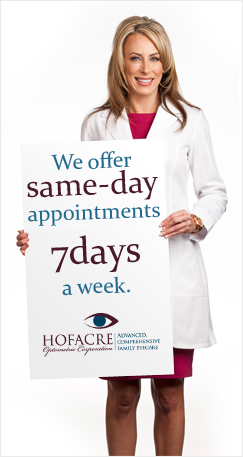 Discover the advantages of getting complete, affordable family vision care at Hofacre Optometric Corporation. We have two convenient locations in San Dimas and Chino Hills. Our Chino Hills optometry office is located at 13111 Peyton Dr, Chino Hills, CA 91709. To reach our Chino Hills optometrists, call us at 909-628-0091. Our San Dimas optometry office is located at 520 N Lone Hill, San Dimas, CA 91773. To reach our San Dimas optometrists, call us at (909) 394-4545. "As an optometrist who needs visual correction to see clearly, I understand how frustrating life is when everything you see is blurry. For that reason, I wanted to become an optometrist so that I can help others improve their quality of vision. I enjoy connecting with my patients and providing them with the opportunity to see the world in its fullest potential. I am committed to providing the highest standard of eye care to all of my patients." "Excellent service She is a great Dr very professional"
"Very impressed with the Dr. Explained every thing thoroughly. Referred me for consult for glaucoma and early cataracts."